The former home of the Pioneer Press newspaper in downtown St. Paul will soon open as an affordable housing complex. The Press House Apartments, located on Cedar Street between 5th and 4th streets, started taking renter applications last week for 144 apartments. The redevelopment, which was estimated to cost more than $49 million, is expected to be complete by mid December. The eight-story building was purchased by St. Paul-based Real Estate Equities for about $8.7 million last November. The building had been vacant since the Pioneer Press sold it in 2015 to a South Dakota development company, which had planned to convert the complex into market-rate apartments. Pioneer Press staff currently have an office in River Park Plaza across the Mississippi River from downtown. The Press House units are restricted to people earning 60 percent of the area median income (AMI). An individual would have to make less than $39,660 a year or a four-person household couldn’t earn more than $56,580 a year. Rents go from $970 for a studio to $1,411 for a three-bedroom unit. 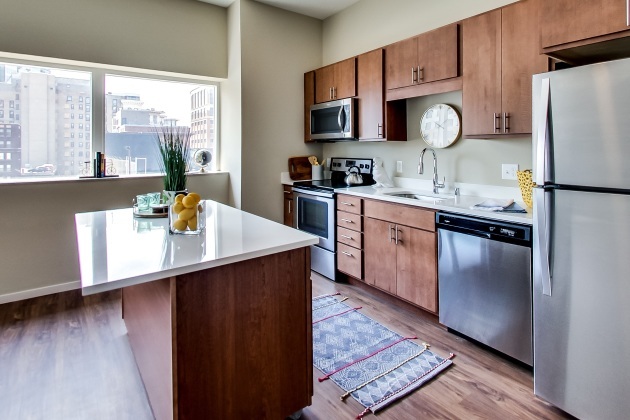 Some of the apartment complex’s amenities include a game room, theater room, yoga room with digital fitness classes and high-end finishes such as stainless steel appliances and quartz countertops. The building is connected to the skyway.